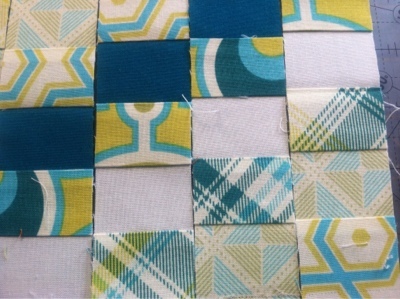 Update, FMQ pictures of my mini 1x1 scrappy trip along. I used my Joel Dewberry scraps for this project. It came out about 12 inches square with the 4 blocks. 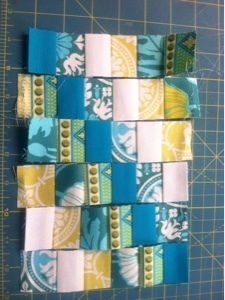 It is FMQ'd in pipe maze by Leah Day. 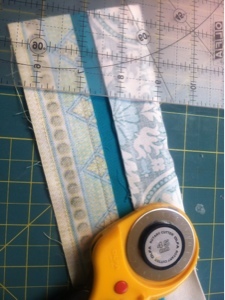 Fun pattern, easy to do and you never need to break thread, which I can appreciate because I often do applique and like to change colors all over the place= lots of thread tails to hide. It's Sunday and I have spent the last 90 minutes browsing all my favorite blogs and discovering a few new ones to add to my weekly reading. Freshly Pieced and it was Thursday....so I missed the link up. So here is my scrappy trip, the strips were 1 1/2 inch wide and the 4 blocks I made came out to 5 1/4" by 5 3/4". Not sure why they were not square?? I like they way it came out. 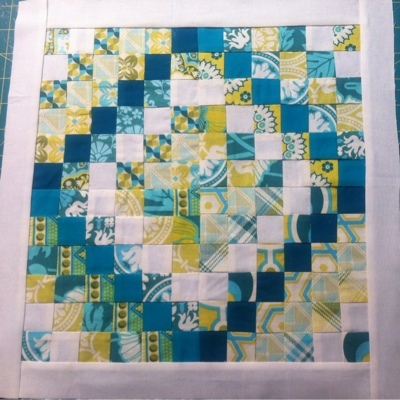 I am going to quilt it with pipe maze by Leah Day. This isn't going to work for my laptop bag but I still have more fabric!!!! I had to laugh. I just posted to my blog and I missed the UFO linkup at Leah Day's blog. Oh well. That's pretty. I have never tried this block....but I definitely need to. I love how your fabrics are mixed. Your scrappy trip is stunning! My daughter went back to college today so things will be getting back to normal around here this week (I hope). Loved the holidays but I'm ready to get back into a routine. I love the colors on your trip around the world! Very sweet.